Garden patios can be a fantastic addition to gardens of any size, both for the way they look and the purpose that they serve. When it comes to choosing what your patio will look like, there are many options available to you, ensuring that you can choose a patio that suits your personal tastes and the look and feel of your property perfectly. Indian Sandstone is a very popular choice, and this article will look at the benefits of this stone and how it can be used for patios and driveways. Indian Sandstone is a sedimentary rock that is often very durable and strong, depending on the material that has been used to cement it. The rock itself is made up of quartz grains and the cementing materials are usually siliceous, feldspathic and calcareous. A common feature of sandstone is ripples and cracks, as these indicate the origins of the different elements that make up the stone – this means that sandstone patios will look unique to one another, owing to the different origins of their elements. You are likely to see the sandstone in colours leaning towards the grey/brown/red/beige end of the spectrum. However, brighter colours can be arranged and it often depends on the minerals that are contained within it. Indian Sandstone was very commonly used in India, primarily used for large structures, until the 1800s, when reinforced concrete became the material of choice. It is now used for flooring and paving because it is dug out from the ground in individual layers, and then smoothed over so it can be used for interior applications as well as exterior. The stones themselves can be arranged to make attractive geometric patterns, with irregular arrangements rather than equilateral stones forming a uniform pattern. This means that as well as the unique subtleties of the stones themselves, they can be arranged in a way that suits your tastes and allows your patio or driveway to stand out from the others. 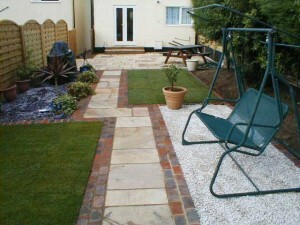 Using Indian Sandstone for your patio is highly recommended for a number of reasons. The durability and aesthetic quality of the stone compliment each other perfectly to ensure that you have a surface that is as resilient as it is attractive. The wide range of colours available means you can choose a style that suits your personal taste and the design of your property without having to compromise on the functionality of the surface. UK Surfacings Ltd are proud to provide expert surfacing services to customers in Croydon and the surrounding areas. If you would like to know more, please get in touch with us today. « How To Lay Tarmac?